It was early November, and I was still trying to settle into the new teaching position I had taken on that August. I had just dismissed my students for the day, and I was sitting in the back of my classroom, exhausted, scrolling through my newsfeed without any real sort of interest, when I came across a post by a former schoolmate promoting a startup publisher, Inkshares, which his venture capital firm was backing. 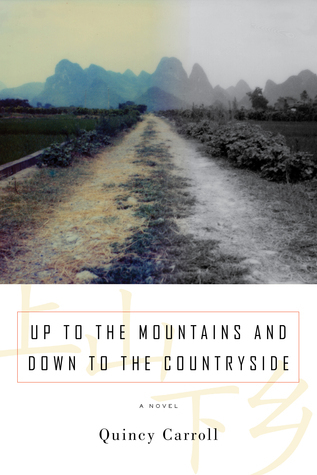 I had just completed my first novel, Up to the Mountains and Down to the Countryside (UMDC), the summer before, after three grueling years of work, and I had been sending queries around to publishers and agents since the beginning of the semester. Feedback had been positive, but no one had agreed to take me on. This is very good, more than one agency had told me, it’s just not for us. Unfortunately, words of encouragement didn’t do me much good. I knew that the story was an honest depiction of life as a Westerner abroad, and one that had not been accurately addressed before, at least not since the days of Orwell or Bowles, and whereas those authors had focused on Burma and North Africa, respectively, my experience lay in modern China - an entirely different beast altogether. What I didn’t know, then, was how I was going to get UMDC to market. The novel focuses on two Americans - one an entitled cynic, the other a young idealist - teaching English in rural Hunan. Although they come off as complete opposites from Day One, their head-butting forces them to question the legitimacy of each other’s presence in Asia and, eventually, re-evaluate how different they actually are. I myself taught in China after graduating from college, and I wanted the novel to reflect all of the adventurousness and pathos I experienced during those years. In this regard, I feel like I succeeded, but it’s no easy task getting published as a first-time writer, and it’s even harder when your genre is literary fiction. Enter Inkshares. I was intrigued almost at once by their value proposition, which is to use crowdfunding to “democratize publishing” by allowing readers to choose the manuscripts they acquire. At the time, they were still new and only had a few books to their name, but they were located in San Francisco (right across the Bay from me), and from what I could tell, their finished products looked good. What did I have to lose? Like I mentioned at the beginning, I was confident in the quality of my writing, but I was starting to get frustrated by the established system - one in which a small number of gatekeepers decide, primarily based on market trends, which works get noticed - and anyway, I understood that beggars can’t be choosers -I was just starting out. In essence, this was “pre-marketing.” Even though I had lived in Hunan for several years, I was not that familiar with the expat scene. I had spent my first two years teaching in an isolated town, where the novel is set, and my last year at a Chinese company, Oceanwing, in Changsha, during which I spent most of my free time holed up inside of my apartment, writing. Publishing my novel through Inkshares forced me to reach out to podcasts, other authors, and blogs. This came in useful several months later, when I passed my goal and it became time to talk about turning the manuscript into a book. The biggest advantage of Inkshares, other than the loyal following you create starting out, has got to be the editorial power you retain as an author. Girl Friday Productions, the firm Inkshares works with to develop its manuscripts, was certainly second-to-none. After two years in an MFA program, I was accustomed to being critiqued, and I was happy with the level of insight my editor brought to the dialogue, but I also felt comfortable sticking with something if I knew in my heart it was right. So now the book is out and I’m on to my second work, and I can’t imagine still obsessing over the first. UMDC is available in bookstores and online, and reviews are arriving from more established sources every day, most recently, The LA Review of Books, and they’ve been overwhelmingly positive. Most importantly, however, I’ve been able to get the book in front of my target demographic, foreigners in China, and the story has proven to resonate with them. As a result, I am a much more confident writer now, and I’ve even become something of a marketer myself. Inkshares enabled me to put my name out there, and as a first-time novelist, what more can you ask?